One of the many reasons I love 100 mile races is their connection to my other life as a horse trainer. Western States and a few other 100s began as endurance rides. Now, the Tevis Cup and Western States are two separate events, held on separate weekends. Other than the silver belt buckles runners earn for finishing,100 mile foot races show little evidence of their equestrian roots. 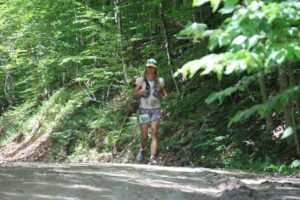 The Vermont 100 is, as far as I know, the only event that still allows horses and runners to tackle 100 miles together, with equine and human endurance athletes sharing a trail. I’m excited to run this race, though not nearly recovered from my rough time at Western States four weeks earlier. 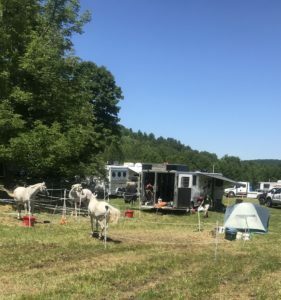 On Friday, the start/finish area at Silver hill meadow is teeming with horses and trailers. People are wearing running shorts or riding tights, Hokas or half chaps. My kind of crowd – I don’t have to decide which of my two favorite universes I want to belong to for the weekend. Chilling and soaking up the horsepower on Friday. While David lines up at the starting line of the 5k offered for crew and family members, I enjoy the peaceful scene, breathing in the familiar horse aroma and feeling grateful for the company of these beautiful animals I get to work with every day, but usually miss like crazy on running weekends. I’m at peace. I’m home. I know, deep down, that this race will be a good one. The Taftsville covered bridge, mile 15. A sight to remember. .
We wake up in our Airbnb on a local alpaca farm at the unlikely hour of 2 am and make it back to Silver Hill in good time for the 4 am start. I ran on horsepower . 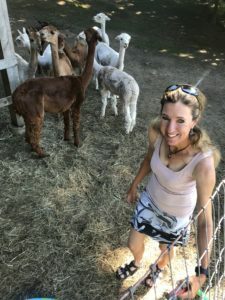 . . maybe with a little bit of alpaca power mixed in. David and I review the plan for the day one last time. 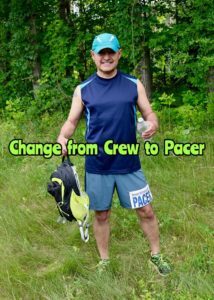 He will meet me at the crew-accessible aid stations, then pace from mile 88 to the end. My A-goal is a sub-24hr finish, my B goal any finish, my dream goal a sub-23. A last cup of coffee, a last kiss and hug from my ultrahusband, and we 100-mile hopefuls take off into the pre-dawn darkness, knowing that most of us will see the sun rise, set, and rise again before we stop. We run through leafy forest as the sky lightens to grey, then blue. The course meanders along dirt roads, up and down rolling hills, through a park-like landscape. 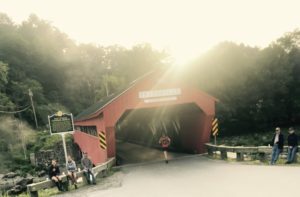 We cross a couple of old covered bridges which make me feel like I’m running through fairy tale. Endurance athletes, all of us. Manicured farms peek out behind wooden fences, cows graze in lush pastures. A few hours into the run, the first horses pass us at a brisk pace, looking focused and businesslike, just like their riders. 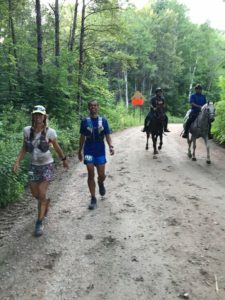 I never see this lead pack again, but do end up running with the same group of mid-pack horses and riders the rest of the way. We fall into a rhythm: they pass me on the uphills, then I pass them on the downhills, or at their vet check points. The youngest rider of this group is just nine years old. She and her grey Arabian always look happy and energetic, which makes me just as happy and energetic – the ripple effect of horsepower. 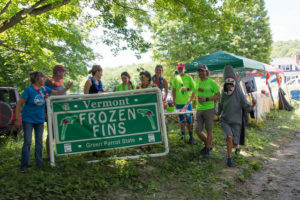 The Vermont 100 has a strict no-headphones rule, understandable because of horses, runners, and sometimes cars sharing the course. I never listen to music for long stretches of an ultra, but I do like using it strategically, during tough spots. Twenty minutes’ worth of high-energy songs can pull me out of a funk when nothing else works. I use my playlist like a performance-enhancing drug, so before the race I worried about having to do without it. 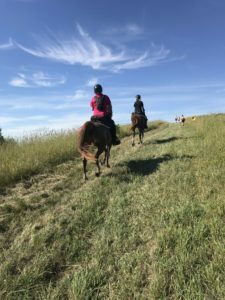 It turns out everything was fine, because of hoofbeats on the dirt roads and Horsepower playing over and over in my head – the only drugs I really needed. As an added bonus, the no-music rule makes conversations with other runners even easier than they normally are. I end up next to a guy in a blue shirt starting around mile 20. We start talking. As it turns out, Andres and I have similar paces and goals, so without trying, we run together for much of the race, pulling each other out of dark stretches and enjoying the high points. Horsepower at mile 27. We soak it up. Mile 27 finds us on top of a green hill, with views of more hills in the misty light. The clop-clop of hoofbeats crescendoes behind us, then our four-legged ultra friends thunder across the meadow, leaving us in the wake of their power and joy. We soak it up. As two seasoned 100-mile veterans, we know that we will have to remember this moments and others like it once the pain sets in during the later miles. .
After that, I don’t have to wait long for a low point. Around mile 40 I feel sore spots in my quads, still lingering from my rough finish at Western States four weeks earlier. While Andres saunters on ahead, I struggle through the next seven miles. I imagine dropping out – of this race and of the Grand Slam. I imagine the pain getting worse from here on until I’m reduced to a crawl by mile 70 and miss the 30-hour cutoff. The song in my head goes silent. I stop feeling the Horsepower. Every 100 has a tough stretch . . . or several. This one was pretty short. By mile 47, I jog into Camp Ten Bear, feeling terrible. David has set up a chair into which I collapse, almost sobbing. He says I still look good, convincing liar that he is. I look at the unopened clif bloks in my pack, and do something sensible for once: realizing I need calories plus electrolytes, I start munching potato chips and pretzels, washing everything down with iced ginger ale. Soon, the magic combo of sugar, salt, and bubbles restores my energy levels. I leave in much better spirits. 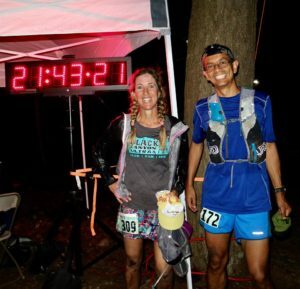 Parrotheads should run aid stations at every 100. It was impossible to leave grouchy from here. After mile 50, I share miles with Charlotte, who is running her second 100 at age 27, and Diego from Arizona, who reads my blog. I start to feel stronger, absorbing horsepower from the group of Arabians who trots past us on the uphill miles. Our little group reaches the Margaritaville aid station in good time, and in good spirits. The exuberant local parrotheads spread such good cheer and mix such excellent frozen concoctions that even those runners who shuffle in looking like death warmed over leave happy. I grab more potato chips and a piece of grilled cheese sandwich, which I dip in salt. Yum! 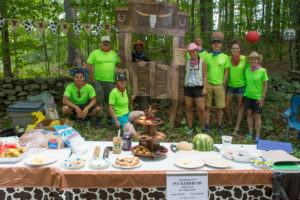 Another themed aid station. Thank you, cowboys and cowgirls! My stomach, which can be so finicky, so uncooperative, during 100 mile races, responds with enthusiasm to gooey Vermont cheddar oozing out between toasted bread. I’ve learned to go with what I crave during ultras, even when it seems counterintuitive, so I continue on a steady diet of salt-dipped grilled cheese squares from every aid station. An unlikely source of energy, but it works. By mile 65, I catch Andres again. We run into the Spirit of 76 aid station together, where David crews for both of us. I want to run this race by feel, without getting obsessed with a time goal, but by now I’m curious: is it still realistic to aim for sub-24? It is, as it turns out. I glance at my pace chart, realizing with a happy jolt that I am well ahead of my splits. Ok, time to be honest here: I’m probably shuffling more than flying by then, but I’m still shuffling past runners who are moving at an even slower pace than mine. 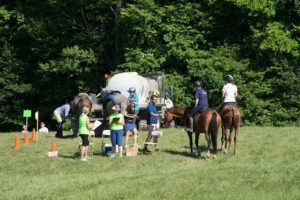 The horses had their own aid stations. I don’t think they served margaritas. At Bill’s, mile 88, there’s no sign of David, which is not really surprising. He has said all day that the aid stations are difficult to find, and I imagine it’s even more difficult in the dark. Besides, I am now so far ahead of even my 23-hour splits, that I don’t really expect him. My ultra husband, ready to pace. His intentions were good, then he got lost in the maze of unnamed, unmarked dirt roads. Plan B means running to the finish without a pacer to motivate me. I don’t mind. I don’t need motivation because I’m still flying high on horsepower and grilled cheese. Polly’s diner at mile 95, the last aid station. I have no idea what time it is, and I don’t care. I can still run (or, more likely, shuffle), so I shuffle on, ridiculously happy under the canopy of trees and silvery moonlight, with hoofbeats echoing in the distance. Mile 97, one last climb to the finish. I hear footsteps behind me. It’s Andres, catching up once again, which makes me even happier. We share the last couple of miles, thank each other, promise to keep in touch. Gentleman that he is, he lets me cross the finish line ahead of him. We hug the extraordinary RD Amy, we hug each other. The clock says 21:38. Are my eyes not working right, like at Leadville last year? I blink. The clock still says 21:38, which means I’ve gone faster than my wildest expectations. David walks up just then, hears that two runners have just finished, and doesn’t realize one of them is me until he sees me sitting there, beaming. Of course, he did not expect me this soon. More hugs, more congratulations. A beautiful day is ending. Sunday morning. Good-bye, Silver Hill meadow! What went right at Vermont? 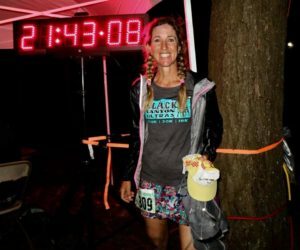 Why did I finish upright and strong, not a barely crawling, blood-covered wreck like at Western States? “Easy 100” is an oxymoron, I know, but this one comes close: no super steep climbs, no technical singletrack, no river crossings, no scorching heat, no altitude. Just rolling hills, beautiful green meadows, aid stations every few miles, a well-marked course. But more important than all those things was the energy from the hoofbeats thundering around me all day. 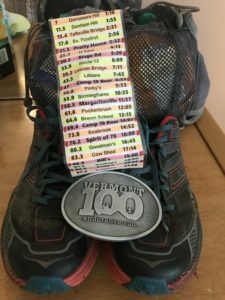 I ran the Vermont 100 on horsepower and grilled cheese – a combination that worked for me. Thank you, Amy, for organizing such a first-class event. 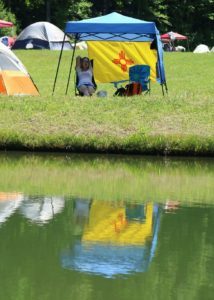 Thank you, amazing volunteers at the many aid stations – you rocked! Thank you, Diego, Charlotte, and Andres, for shared miles, shared joy, and shared misery, for the laughs and the deep conversations. 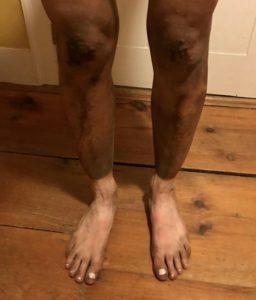 And, as always, thank you, David, for driving around unnamed, unmarked dirt roads all day and most of the night, for changing my filthy socks, for drawing smiley faces into the dirt on my legs, for encouraging me when I wanted to quit, for making me laugh when I wanted to cry. You’re the best ultrahusband any woman could wish for. This entry was posted in Uncategorized on August 8, 2018 by silvakat. 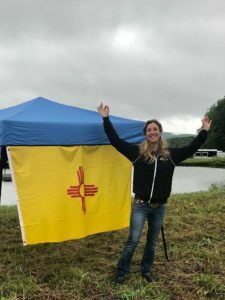 Great race report Katrin! Makes me want to run Vermont again. Looking forward to the next two – will be there to celebrate with you. Thanks, Tammy, for sharing the trail work day, and for everything else you are doing to make my grand slam a) possible and b) fun. I really look forward to you pacing me at Leadville! Thank you, Joanna. I might take you up on your offer. Seeing the endurance horses and riders all day in Vermont really made me want to try it. 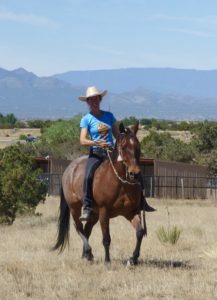 You are not only a talented ultra runner/equestrian but also a talented writer. Good luck at Wasatch, I will be looking for your race report. 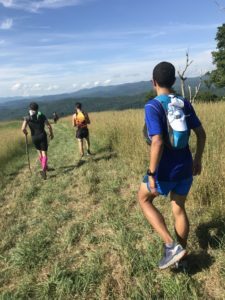 Hi Diego, I enjoyed sharing miles with you at Vermont and look forward to seeing you again at another ultra soon – Javelina, maybe. I am not ready for Leadville, much less for Wasatch, but at least the race reports will be more interesting if I struggle!